Android is a mobile operating system based on Linux kernel with additional middleware services and key applications configured specifically for the mobile devices, tablet computers developed by Google. Android is an open development platform which consists of an Android SDK which provides the tools and API’s needed for developing applications on the Android platform, using Java programming language. Android was acquired by Google in the year 2005. Since then, Android has come with many new versions, with newer updates and features. Android has seen a number of features and updates in each of the above versions like HTML5 support, flash support, color effects, Wi-Fi hotspot tethering, multicore processors, video calling, Bluetooth etc. Android architecture also consists of a Dalvik virtual machine which provides the runtime execution environment of all Android applications in the android device. Android comes with its own inbuilt browser based on the WebKit layout engine. Android consists of an Android market which is the online store developed and maintained by Google for Android mobiles and tablets. The users have a few applications from Android Market preinstalled in their devices; the users can also browse and download applications published by many third party developers in the Android Market app store. The iPhone is a smart phone designed and marketed by Apple, configured to operate with an Apple operating system called iOS. The first iPhone was first released on June 29th, 2007 by the Apple then-CEO, Steve Jobs. iPhone consists of various features like Video camera, Wi-Fi, 3G, multi-touch screen etc. iPhone has 5 generations and the iPhone4S came with cool voice activated personal assistant called “Siri”. The Apple operating system iOS is a variant of Darwin operating system found in Mac OS, however iOS takes less than half a gigabyte only. The web browser used in iPhone is Safari which displays the web pages in the phone similar to any other browser. Apple also has an online app store which acts as a repository for many third party and Apple applications which could be downloaded and installed in the user’s respective iPhone. Android devices and iPhone has a number of similarities as both were meant to provide the new Smartphone’s features to the mobile users of both platforms. 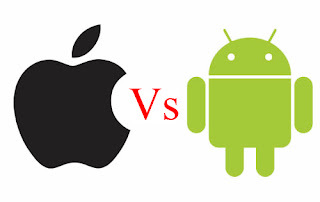 Some common features supported by both Android and iPhone include an Online app store maintained by both, Android Market in Android and Apple app store in iPhone. This online store contains a number of applications which can be downloaded in the device. Both Android and iPhone supports Wi-Fi, 3G, blue-tooth etc. Another similarity is form factor where form factor includes size, shape, interaction paradigm, full web browser, on screen keyboard. Though Android and iPhone is meant to serve the new Smartphone features to the mobile users, there are some differences that are to be noted between Android and iPhone. Android devices are configured with an Android operating system developed by Google whereas iPhone, developed by Apple, is configured to operate with its own iOS operating system. Android’s operating system is Linux based and it’s the open development platform where any third parties can develop android applications using Android SDK and API; install the applications in the Android devices, thus making Android to be device independent. On the other hand, Apple’s iOS is similar to Mac OS, which is device dependent. Another important difference is the online app store in Android is the Android Market store managed by Google and in iPhone it is Apple’s app store managed by Apple. Other key differences are iPhone comes with the Safari web browser which does not support Java and Flash whereas Android comes with its own inbuilt browser, based on Web-kit, which provides full support to Flash and Java. In terms of display, instead of icons littering in your desktop like in iPhone, Android phone adds widgets to the desktop. Android also comes with additional support for buttons which instantly allows to turn on/off certain connectivity options easily. This feature is not available in iPhone. Another important difference is that Android supports multi-notification with the help of its Notification manager. The notification bar in the Android phones can alert you to new voice and email messages, facebook notifications etc. In-terms of PC connection, in Android, unlike iPhone there is no need to have iTunes to manage the phone because Android can mount the SD card so that it is usable by any operating system. On this, music and files can be added which will then be usable on the phone. Flash support is another main difference between iPhone and Android, Apple have never include flash support on their devices on the other hand android boasts its flash support.